Hadiya at the homeopathy college in Salem, where she will resume her studies from tomorrow. Kerala woman Hadiya, who said she hopes to meet her husband Shafin Jahan in Salem, may get her wish. The Principal of the homeopathy college where she got admission today, says she will be allowed to meet him with permission of the college. The 25-year-old got admission at the Sivaraj Homeopathy Medical College in Salem, a town in western Tamil Nadu, after an order from the Supreme Court, which released her from her parents' custody, and asked her to complete her studies. Hadiya, Principal G Kannan said, has been admitted as Akhila Asokan, the name she was born with, and will start her classes tomorrow. Asked if she would be allowed to meet her husband, Mr Kannan told NDTV, "I'd allow her to meet anyone including her husband with my permission". While the top court did not take a decision on her marriage yesterday, a lawyer had said the ruling meant she was free to meet her husband at the college hostel, where she will stay. Hadiya said she has sought permission to meet her husband. "I think they will allow," she told reporters after a meeting with the authorities of the college, where she would do an internship for the next 11 months. 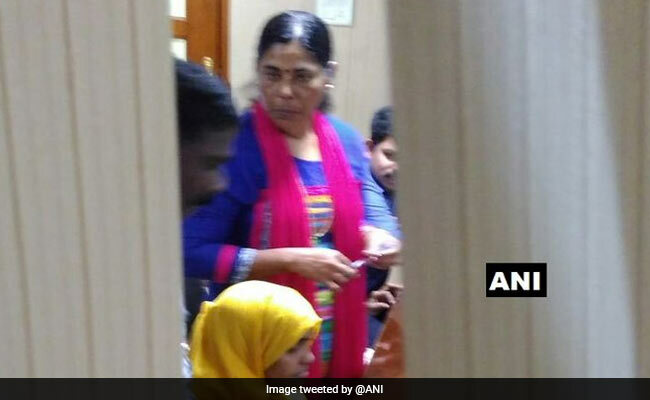 Hadiya's parents had refused to accept her marriage to Shafin Jahan -- a Muslim who returned to Kerala from the Middle East -- claiming that he was a terrorist who wanted to take their daughter to Syria. Following their petition that she had been brainwashed and forced into the marriage, the Kerala High Court had ordered an annulment and gave her custody to her parents in May this year. Shafin Jahan had challenged the order in the top court. Yesterday as the Supreme Court gave her a reprieve and asked her to resume her studies at the university, Hadiya said she hoped to meet her husband finally. "I want to meet Shafin Jahan. I believe I will meet him in Salem," she repeatedly told reporters at the Delhi airport. Hadiya, who was taken to the college today amid heavy security, said it would be in place for at least the next two days.